A black and white negative of trees lining the Crawforth property. The Crawforth house is visible through the trees. 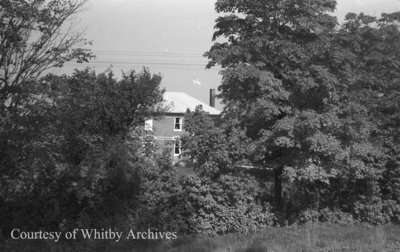 The Crawforth farm on Victoria Street near the Whitby-East Whitby border, was demolished for the construction of Highway 401 in 1939. Crawforth Farm, October 12, 1938, Marjorie Ruddy. Whitby Archives A2013_040_746B.